With apologies to Charles Dickens for the paraphrasing. Wilkins Micawber knew from his own experience that a small but persistent excess of spending over income eventually leads to disaster; in his case, debtors’ prison. Similarly, a small and sustained rise in sea level—once it is combined with unusual weather and high tides—can push ocean waters, quite literally, over a tipping point; as the people in New York and New Jersey, in the wake of Hurricane Sandy, have just witnessed. 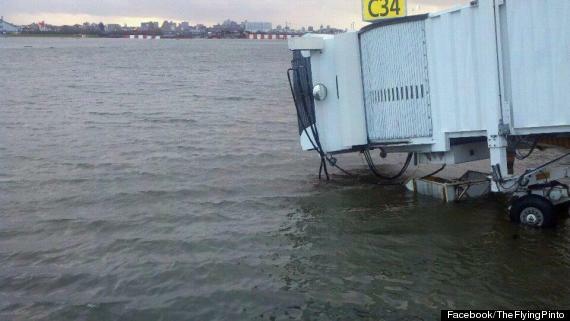 Michael Mann has remarked that sea levels around New York are about a foot higher than they were a century ago. One foot may seem small compared to everyday waves and tides, but as we have seen, this sustained change to the baseline can make all the difference between a badstorm surge and a disastrous one. And, of course, the effects of an extra foot of seawater, compared to no water at all, is a very big deal indeed when that water is lying on a farmer’s field, your living room floor or an airport runway. The best estimates of future sea levels predict several additional feet of sea-level rise in New York over the next few decades: the recent flooding in the US north-east is a just a taste of things to come. Among the three big consequences of human abuse of the atmosphere—climate change, rising seas and ocean acidification— sea-level rise is the easiest to visualize; yet we have lacked a good book on the subject suitable for the general reader. Until now. Authors Hunt Janin and Scott A. Mandia have provided us with a comprehensive guide to the causes and consequences of rising seas with their excellent new book. 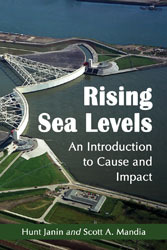 In Rising Sea Levels: An Introduction to Cause and Impact, they explain the basics behind the science of climate changeand how a warming world will inexorably produce higher sea levels due to the thawing of the giantice sheets and the expansion of the warming seawater itself. Hunt Janin is an American writer living in France who has published scholarly works on a wide range of subjects, from medieval history to cross-cultural studies. Scott Mandia is a professor of physical science at the Suffolk County Community College on Long Island, New York and is the co-founder of the Climate Science Legal Defense Fund and the Climate Science Rapid Response Team. Together, they have produced a timely book on a vital subject and one that is accessible to the general reader. It is well-referenced and scientifically accurate. In addition to their coverage of the science, Janin and Mandia devote great attention to the impacts of sea-level rise on coastal cities (e.g., Miami, New York, London and Venice) and entire countries (Tuvalu, Kiribati). Most critical is the threat to some of the megadeltas in the developing world such as the Nile, the Ganges-Brahmaputra and the Mekong. Not only are these deltas home to many millions of people, but they also provide irreplaceable agricultural land. Because of the complex shapes of their islands and channels, deltas are difficult areas to protect from rising sea levels. A compounding problem is that deltas are areas of natural subsidence, a process accelerated by human activities such as pumping groundwater and, ironically, flood control measures that increase erosion and change sedimentation patterns. Mr Micawber is also known for his optimistic expression “Something will turn up!”. Janin and Mandia’s concluding message is that it would be folly for us to rely on wishful thinking when it comes to sea-level rise. Our fossil fuel emissions have caused the rising trend and it is entirely up to us to both slow the process down and to protect ourselves from the harm that it will bring. Rising seas will impose a huge economic burden of adaptation on the world, burdens that rich countries may be able to shoulder, but that may be crushing for poor countries such as Bangladesh. Sea-level rise will be a dominant factor shaping the economic, social and even physical geography of the next few centuries. Rising Sea Levels provides an essential backgrounder for this unfolding global crisis. Note: Hunt Janin and Scott Mandia have previously commented or contributed at Skeptical Science. This entry was posted in Book Review and tagged Sea Level. Bookmark the permalink.